Most communities in the U.S. treat their wastewater just enough to legally dump it, but not reuse it. Pasteurization Technology Group has developed an inexpensive treatment system that yields water clean enough to be returned to aquifers. Instead of using chlorine, the system pasteurizes wastewater by heating it to 180ºF. The warmth comes from the waste heat of a nearby electricity generator running on either natural gas or biogas produced by an associated sewage digester. A PTG water plant opening next year in California expects to make a $160,000 annual profit by selling its extra biogas-generated electricity. Even if the turbine is fueled with natural gas, the pasteurization is energy-efficient enough to be about half the cost of chlorine treatment. This content was borrowed from Popular Science Magazine. The Barry-Wehmiller Company and CBI Fleetwood, both divisions of FleetwoodGoldcoWyard, are offering the Volutherm series Flash Pasteurizer. The Flash Pasteurizer has been incredibly well received and successful in some of Europe's most known beverage and brewery companies and is now being manufactured in the United States to U.S. standards and available in North America. The Volutherm series Flash Pasteurizer, developed for the brewery and beverage market, can also be utilized in many aspects of the packaging market and offers clients continuous and consistent pasteurization for their products. 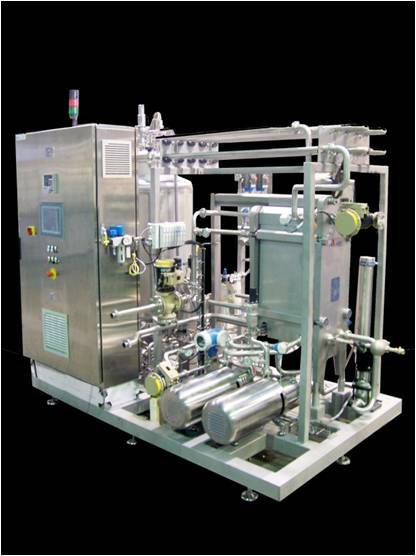 The pasteurization process is one of the most important unit operations in beverage processing. 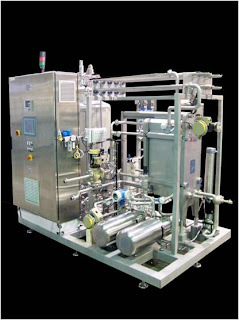 Continuous pasteurization has numerous advantages over the batch (vat) pasteurization method, such as time, hygiene and cost of operation – energy savings. The Volutherm series Flash Pasteurizer utilizes a high-temperature, short time (HTST) method for most continuous pasteurization processes. The heat treatment can be achieved using either a plate heat exchanger (PHE) or a tubular heat exchanger, depending upon the product being pasteurized. The capacity range is 10gpm to 300gpm and is sized to accommodate virtually any line speed. Some of the features and benefits of the Volutherm series Flash Pasteurizer include gentle product handling, automated clean-in-place (CIP) / sterilization-in-place (SIP) with guaranteed repeatability at variable flow rates, process records and charting. The unit is compact in design and energy efficient – offering greater than 90% energy recovery. The Volutherm series Flash Pasteurizer meets all standards for safety and beverage operations. For more information, click here. 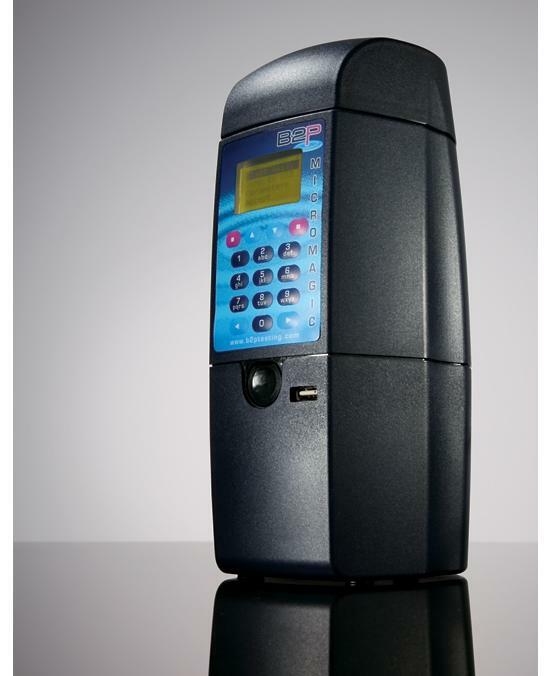 The MicroMagic device is smaller than a two liter bottle. It samples for for E. coli and provides results in hours as opposed to days . B2P says it will launch additional tests next year for listeria, salmonella and other bacteria. The technology will be a game changer for early detection systems in food safety. We stumbled across this in Popular Science Magazine. You can visit the manufacturer at B2P. It has become extraordinarily difficult to find pasteurized wine. The high alcohol content combined with excellent filtering processes, sterility in the winery, and the general acceptance that wine must be sheltered from heat and sunlight and stored under certain conditions have allowed the wine industry to avoid pasteurization. As it is a thermal process wine is more susceptible to changes in flavor due the temperature than other beverages. Its common knowledge that the wine industry is highly competitive when it comes to flavor. 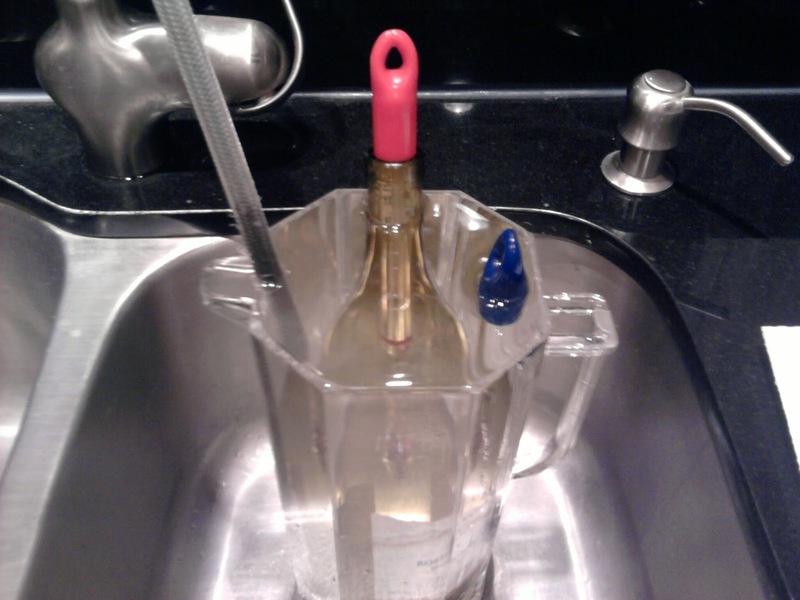 Pasteurization is a process of time and temperature originally created for use with wine. 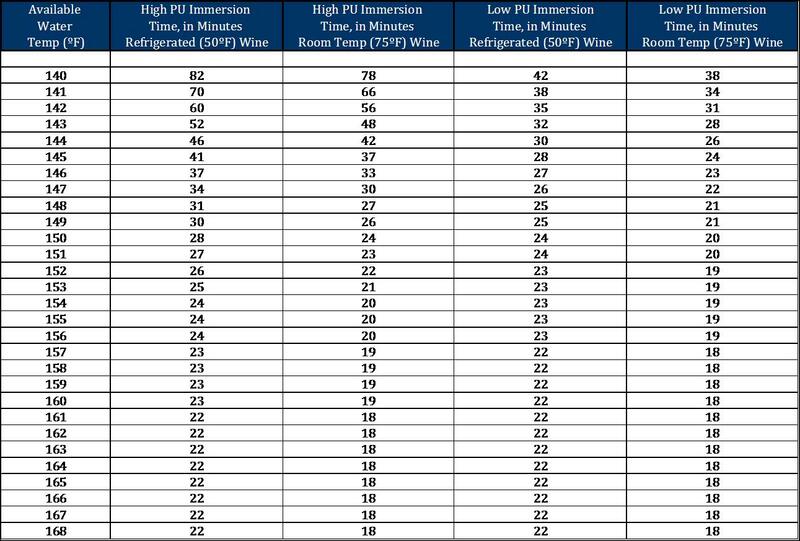 Pasteurization in this article is outlined based on two levels which are considered "high PU" and "low PU" depending on the purpose of the pasteurization. Low PU is intended to stop fermentation and neutralize any bacteria which may have been picked up in the wine making process. High PU is for use if the wine is needed for medical purposes (i.e. consumption by persons with weakened immune systems, cautionary pregnancy, etc). Contrary to popular belief, Kosher wine is not pasteurized. It is made from pasteurized grape juice but fermented and subject to contamination after the fact. 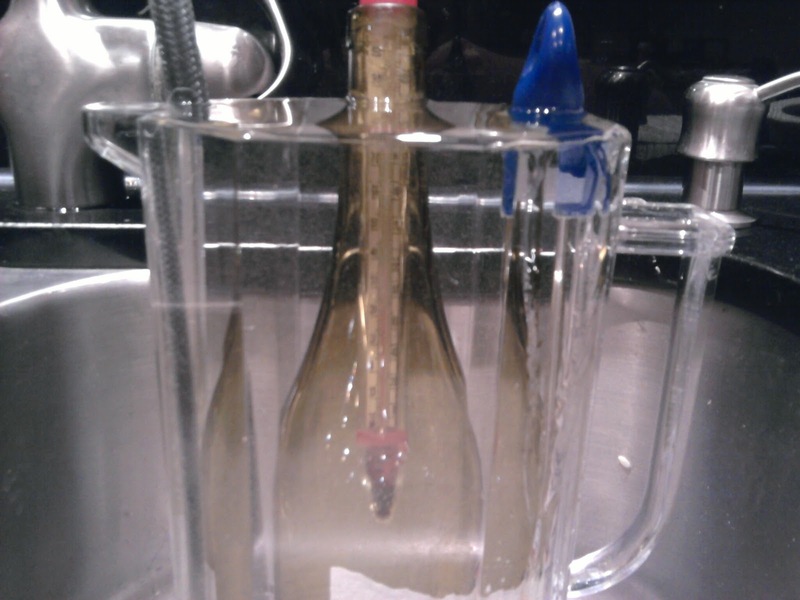 The process outlined here is for a 750ml bottle of red or white wine. The pasteurization time varies depending on the water temperature being used. This process can be executed in a sink or any bath of water. The water temperature can be determined by running hot water over the end of a thermometer for 2 - 3 minutes. As can be seen by the pictures part of the process is to keep water flowing at all times. New water needs to be injected into the bottom of the bath allowing the water to overflow out the top. Other techniques (such as cracking the drain) work although sometimes difficult to ensure that the loss of water through the drain is the same as the water being put into the process. This leads to issues with level. 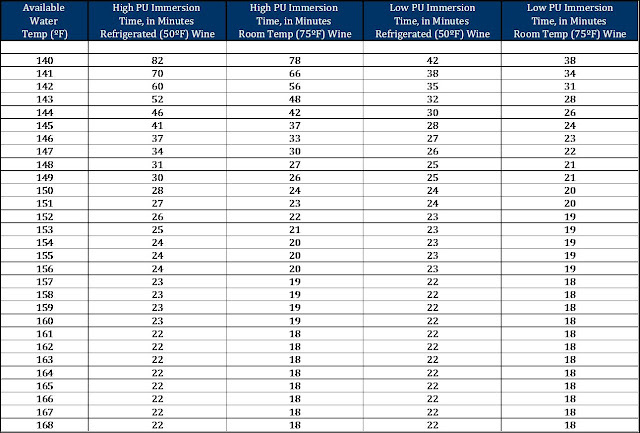 The chart below outlines the required time for immersion to achieve the pasteurization goal. Remember that sudden changes in temperature can cause glass to crack. Remember to be gentle with temperature changes upward or downward to give the glass time to adjust. 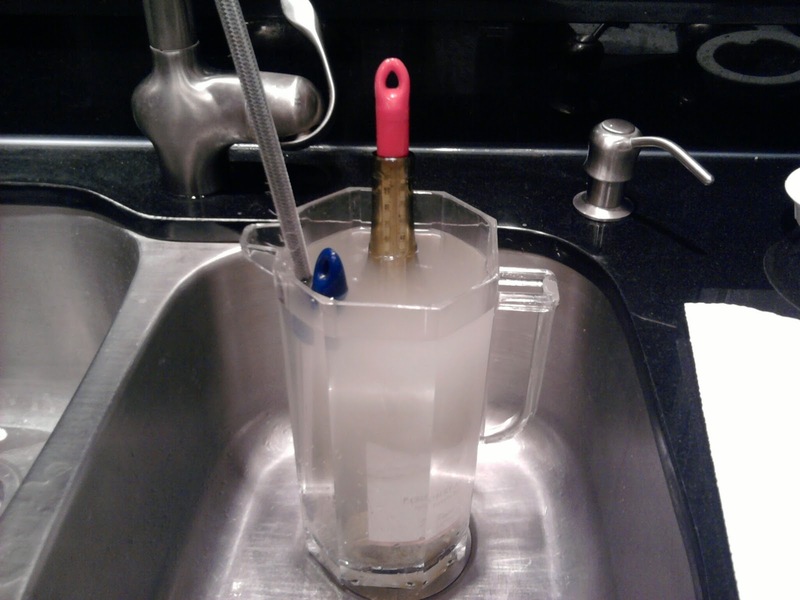 When the pasteurization process is complete, use the cold water to bring the bath temperature down. Cooling the bottle as quickly as possible will minimize flavor impact. To judge the impact to the flavor, consider using two bottles of the same product, pasteurizing one bottle and leaving the other as a control group. Click on the chart to blow up to full size. 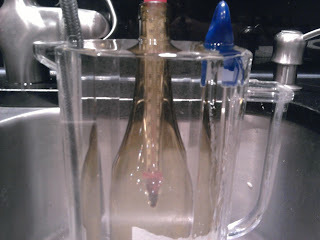 Also note that you will not need a thermometer in the wine bottle as shown in these pictures. Corks have been known to lift in this process and a screw cap may be advantageous.